I can’t believe I haven’t posted this recipe yet. My sisters and I ate this ALL the time growing up. Still do actually. No one else’s pasta salad has ever come close to this one because it is the best! It is the perfect dish to bring along to a cook out or potluck, or make a batch of it to eat throughout the week. The salad takes almost no time to throw together, so when I’m in a pinch to make something this is my go-to side dish. Add whatever veggies you like or have on hand, chopped up of course. 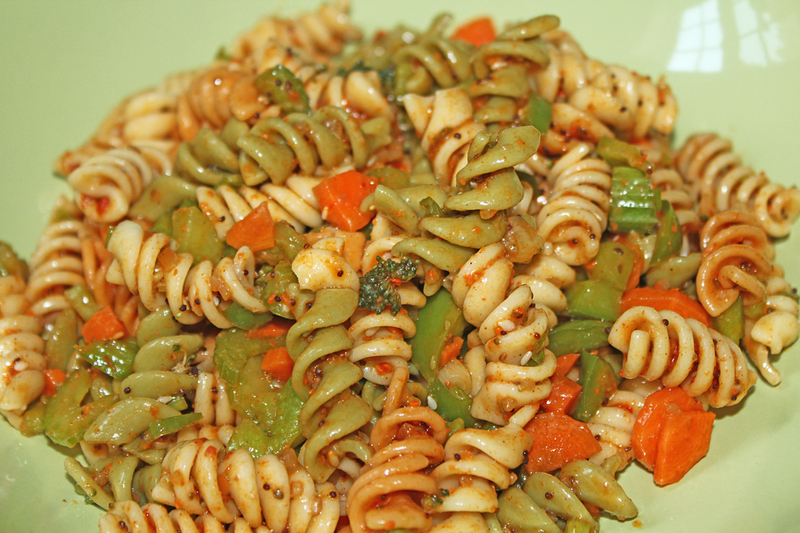 -Add all chopped vegetables, dressing, seasoning, and cooked pasta to a bowl or a food storage container. Stir to combine. -Cover and refrigerate. Eat once it is cool but flavors will develop more overnight. *If mixed in a food storage container, it is fun to put the lid on and just shake it! Fun job for the kiddos. Add cherry tomatoes, olives, sweet peppers, feta cheese. Next ›What Goes in to Printing a Catalog? It is so addicting. My mom made a good point. This one of the few things all 3 of us sisters would ALL eat! Simple recipes so often can be the best! Colorful and easy! Really great recipe! I love making pasta salads. They're great for on-the-go lunches. Thanks for sharing! I love that this is colorful and veggie-filled! Love dishes that you can control the color. Makes cooking even more fun. This one gets better as the week goes on. Let me know when you try it out! Sometimes I'll add a red, orange, or yellow pepper instead. Or a red onion. Changes the look completely! What a fantastic pasta salad! Love all of the vegetables!